To achieve the company’s environmental goal of operating vehicles on a cleaner-burning alternative fuel, while reducing fuel costs for their franchisee owner-operators. 7,800 fewer gallons of gasoline burned per year, per van by switching to propane autogas. 35,000 pounds of carbon dioxide emissions reduced per van each year. $10,400 savings in fuel costs per van annually for SuperShuttle franchisee owner/operators. 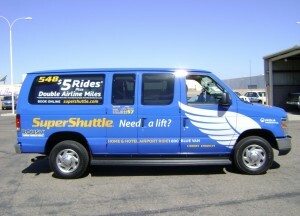 In 2009, SuperShuttle, a recognized name in the airport ground transportation and shared-ride business, turned their trademark blue and yellow shuttle vans “green” by incorporating propane autogas vehicles into their fleet. SuperShuttle fuels 75 ROUSH CleanTech Ford E-350 vans with propane autogas, driving passengers to and from Phoenix Sky Harbor International Airport. These alternative fuel vehicles offer fuel and maintenance cost savings and reduced carbon emissions to their franchisee owner-operators. The most widely used alternative fuel and the world’s third most common engine fuel, propane autogas produces 20 percent less nitrogen oxide, up to 60 percent less carbon monoxide, up to 25 percent fewer greenhouse gas emissions, and fewer particulate emissions when compared to gasoline. 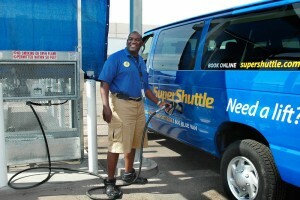 Each SuperShuttle franchise uses about 150 gallons of fuel weekly for each vehicle during its operational lifecycle. By fueling with propane autogas, SuperShuttle franchisee owner-operators save an average of $200 per week, or $10,400 per year, while reducing petroleum consumption. Drivers report reduced vehicle downtime and far fewer maintenance issues with fuel and ignition system components, according to Brooks. “By making the switch to propane autogas, our franchises not only save money and lower our dependence on foreign oil, but also positively impact the environment. This is something each franchisee owner can feel good about,” said Brooks. During its lifecycle, each van emits 175,000 fewer pounds of carbon dioxide into the atmosphere by operating on propane autogas instead of gasoline. For the 75 propane autogas powered vehicles in operation today, that’s more than 13 million less pounds of carbon dioxide being emitted into the skies above Phoenix during the next five years. Established more than 25 years ago, SuperShuttle continues its principal mission of providing reliable and friendly door-to-door airport service. With the added objective of planet preservation, SuperShuttle recycles tires and automotive fluids, and uses alternative energy sources like propane autogas. Brooks adds that the warranty and reputation that comes with each ROUSH CleanTech vehicle were the primary reasons SuperShuttle forged the partnership. All ROUSH CleanTech propane autogas vans, shuttles and buses have certification from the California Air Resources Board and Environmental Protection Agency, and add less than 10 pounds of weight to the vehicle. To make it even more convenient and profitable for their franchisee owners in Phoenix, SuperShuttle installed a centrally located 2,000-gallon propane autogas fueling station. While Brooks says there is sufficient propane autogas infrastructure in and around Phoenix for ease of refueling, their company-owned, 24-hour station provides an additional $.30 per gallon fuel cost savings over the retail stations. More than 20,000 passengers each day choose to travel in SuperShuttle vans at airports across the United States. As fueling infrastructure develops, Brooks plans to expand the company’s use of propane autogas vans to additional airport markets, including California, Colorado and Texas. Propane autogas already has the largest infrastructure of all alternative fuels, and private / public partnerships exist for further expansion from niche market to mainstream. The Western Propane Gas Association honored SuperShuttle with a Propane Hero award at the 2010 Green Fleet Conference in San Diego for showing other companies across the U.S. that switching to a domestically produced, eco-conscious fuel is economically feasible, practical and available today. About SuperShuttle: In 1983, SuperShuttle pioneered the shared-ride airport ground transportation concept with the opening of its Los Angeles, California operation. Today SuperShuttle is the premier shared-ride airport transportation service in the United States, providing door-to-door service for more than 8 million passengers per year. Currently, SuperShuttle provides service to and from 39 airports and over 50 cities and has approximately 1,400 distinctive blue and yellow vans on the road. It is a wholly owned subsidiary of Veolia Transportation.